Give the gift of a laugh that's also a tasty treat! This Chocolate Nut Toffee is made in Oregon with Hazelnuts grown up the road on a local farm. Toffee Peanuts & the Chocolate are crafted in small batches right on the farm. 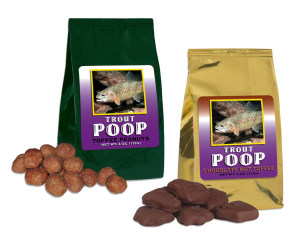 Without doubt, the most delicious poop, trout or otherwise, you will ever have! Each set has one 4oz gold foil bag of Chocolate Nut Toffee and one green foil bag of Toffee Peanuts.